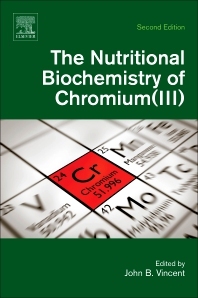 The Nutritional Biochemistry of Chromium(III), Second Edition, reviews the fields of chromium biochemistry and nutrition and how they have dramatically changed in the last decade. Editor John Vincent has lead much of the research that has resulted in new discoveries and reversals of previously held beliefs, such as health concerns surrounding the toxicity of chromium(III). New sections include a review of new evidence showing why chromium may not be an essential element, why national recommendations may need updating, and new data on the use of chromium supplementation in animal feeds. Discussions on the controversial topic of the role of chromium(III) at the molecular level in insulin signaling and information on cell cultures and in vitro assays of chromium toxicity are also covered. John D. Vincent is a Professor in the Department of Chemistry, The University of Alabama, as well as Co-Editor-in-Chief of Biological Trace Element Research, with over 25 years in the field of chromium(III) biochemistry.